The two ISIS fighters appear to be sitting in a car when the unidentified woman, dressed in traditional Arab clothing, approaches them to deliver what happens to be a curse on the militant group. "Oh you devils, turn back to God," she says, asking the fighters about the "slaughter" of a local Kurd and "all those" they had previously killed. "It's all forbidden. I swear nothing what you have done was in the way of God." "Turn back to God," she repeats, like mantra. "This slaughter is forbidden." The men in the car first seem to be taken aback by the elderly woman's audacity. “Granny, what do you mean? Surely, it is right between us,” they ask laughing off of her remarks. The granny then quotes several passages from the Koran, accusing them of violating the teachings of Syrian Sunni Muslim imams. 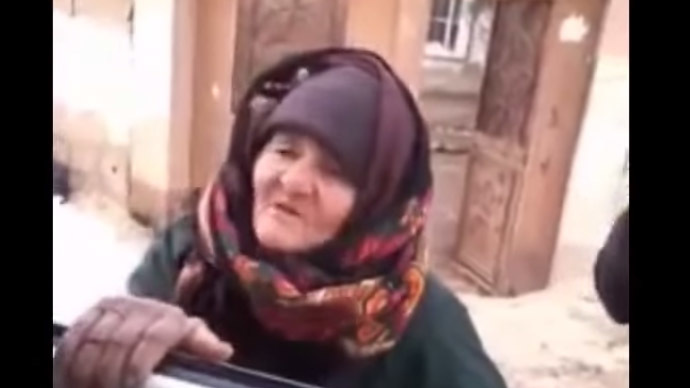 "Grandmother we don't have any free time, go away," one of the jihadists tells her. @sherif_elko Granny telling ISIS made my day ! The more they laughed she got mad ! Told them good! But the granny has not finished yet: "Neither of you will win, nor will anybody, you only will keep killing each other like donkeys." "Oh, granny is a poet," the militants joke in response. "Now when you got money from America and weapons of America you want to kill each other," granny continues her verbal attack. "What you said was correct," one of the fighters replies. "Turn back to God," she urges. "We are now going," they reply. "God is watching what you are doing," she wraps up in the last moments of the video. The Islamic State (also known as ISIS, or ISIL) is a jihadist rebel group that controls territory in Iraq and Syria and operates in eastern Libya, the Sinai Peninsula of Egypt, and other areas of the Middle East, North Africa and Asia. The United Nations has held the group responsible for war and human rights crimes, while Amnesty International has reported ethnic cleansing by the group on a "historic scale". Amnesty International has found that the IS has systematically targeted non-Arab and non-Sunni Muslim communities, killing or abducting hundreds, possibly thousands, and forcing more than 830,000 others to flee the areas it has captured since 10 June 2014. The Islamic State has recently threatened to execute at least 17 Kurdish fighters burning them alive in a cage, in a similar manner as it killed Jordanian pilot Muath al-Kaseasbeh. ISIS began its initial offensive on Kobani, a city in northern Syria, in mid-September after capturing more than 300 towns and villages in the area. More than 200,000 Kurdish residents have been forced to flee their homes, with most of them heading across the border to Turkey. In a new four-minute video the men dressed in orange jumpsuits are being paraded around the northwestern Iraqi town of Kirkuk while in cages. On Friday several Islamic State fighters who attacked an Iraqi air base that hosts about 400 US forces were killed in a counter-attack by Iraqi troops, according to US military officials. The burning alive of the Kurdish fighters is seen as a possible revenge by ISIS following reports of Kurdish forces allegedly dragging bodies of the jihadists through streets in the Kurdistan region of Iraq, according to The Daily Mail.